At 33 years old and with 68 professional fights on his resume, Barrera could make a strong case for calling it quits, and no one would blame him if when he exits the ring at Mandalay Bay Events Center, it’s for the last time. But too many fighters have said they were through, only to climb back through the ropes for one more payday. “Win or lose, that’s it,” Barrera said through a translator, though he claimed he’d probably fight one last time in his native Mexico, where he is considered one of the country’s great boxing champions, in an exhibition. Perhaps more pertinent questions for Barrera are — can he turn back the clock again, and does he have the physical wherewithal to avenge a 2003 loss to the 28-year-old Pacquiao? Barrera claims to have trained harder for this fight than any in recent memory. His brother Jorge, who trains him, said Barrera is faster and stronger. Oscar De La Hoya, who knows something about comebacks and is Barrera’s promoter, said Barrera is most dangerous when nobody gives him a chance. And the way the betting is going on this fight, few are willing to back Barrera. Pacquiao opened as a minus-260 favorite. On Thursday, he was nearly a 31/2-1 choice to defeat Barrera again. Maybe he doesn’t want to remember the night of Nov. 15, 2003, in San Antonio. He thought he would dispose of Pacquiao with little problem. After all, Barrera had battled many of boxing’s best. He rallied to stop Kennedy McKinney and knocked out Jesse Benavides. He lost to Junior Jones and Erik Morales, but came back to beat Prince Naseem Hamed and avenge his loss to Morales, who won a third fight with Barrera in 2004. 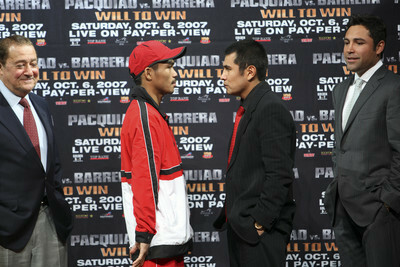 In Barrera’s mind, Pacquiao wasn’t supposed to beat him. But after a slow start, Pacquiao began to dominate and wound up scoring an 11th-round technical knockout. Barrera has been seeking revenge ever since. He is 6-1 since the loss to Pacquiao, with the lone defeat coming March 17 when he lost a 12-round decision to Juan Marquez at Mandalay Bay for the WBC super featherweight title. Barrera keeps saying his loss to Pacquiao was the result of him having a bad night. But the reality is Barrera is four years older and has absorbed a lot of punishment. Even if he’s quicker and as strong as his brother claims he is, Barrera still has to figure out a way to neutralize Pacquiao’s superior speed. Barrera sparred with WBA super featherweight champ Edwin Valero while training in Mexico to deal with Pacquiao’s punching power, and Barrera said he expects a different outcome this time because of his preparation. “At my age, there’s not much I can change,” he said. “I’m 33 years old. … I have my style. Win or lose, Barrera’s body of work puts him on the short list of great Mexican fighters. He’s probably not at the top with Julio Cesar Chavez, Salvador Sanchez, Carlos Zarate, Ruben Olivares and Lupe Pintor, but in the next group, along with Morales. That’s by his own admission. Contact reporter Steve Carp at scarp@ reviewjournal.com or (702) 387-2913.